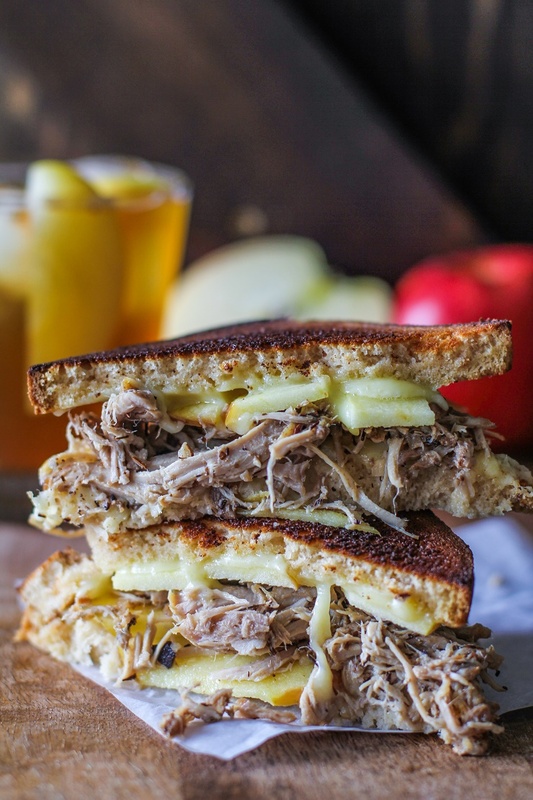 Tender, flavorful crock pot pulled pork and apples made easily in your slow cooker. Only a few ingredients are needed to prepare this cozy fall meal meal. 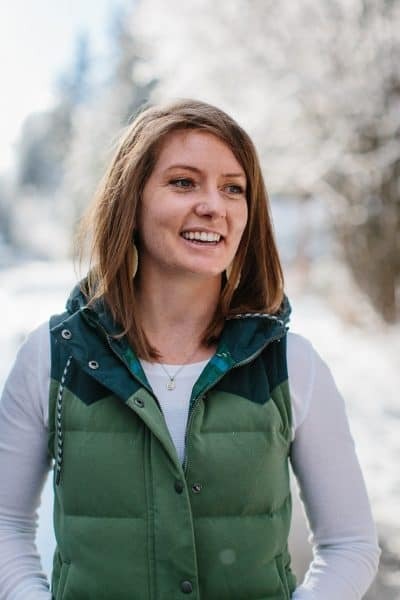 This winter, I have been surviving – nay, thriving – off of crock pot meals. Aside from the ease-of-preparation and the eventual comforting result, one of my favorite parts about slow cooking is I can take the shotgun approach with ingredients and be reasonably assured the result will be nothing short of epic. Rummaging through the pantry and refrigerator and throwing whatever sparks my feelers into the crock effectively metamorphosizes my lazy take on food prep into actual genius – saved by virtue of the fact that flavors textures end up melding together into a solid dining experience. On the flip side of the everything-but-the kitchen sink approach, so much magic can be made with so very little as well. So much flavor derived from a little bit of solid, liquid, spice – a testament to the beauty of minimalist cooking. Take, for instance, this recipe. 8 basic ingredients. Nothing shmancy or requiring of research. So little input, so very much output. Crock potting is my go-to when it comes to shredding meat, as it’s a fool-proof way of getting the tender result I’m looking for. I usually set everything up the night before, allow the magic to happen during the sleeping hours, then awake with the luscious rich scents of slow cooked sustenance. You guys are going to think I’m loco en mi cabeza, but I used legit apple cider as the liquid in this slow cooking extravaganza. Have you tried such a thing before? 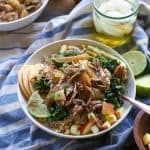 My first go round with this technique debuted on the blog a few years back in my Cider Chai Crock Pot Pulled Pork recipe. You see, turns out we can use all sorts of liquid for crock potting, including but not limited to: juice, booze, tea, coffee (see an example of this in my Crock Pot Hawaiian Pulled Pork Burrito Bowls), something I don’t even know about. Fact is, broth is a marvelous win for flavor, but other liquids can give your slow cooker meals that certain je ne sais quois that keeps you intrigued and coming back for more. In the realm of slow cooker (or one pot or crock pot) meals, this recipe is so silly easy, it’s almost laughable. 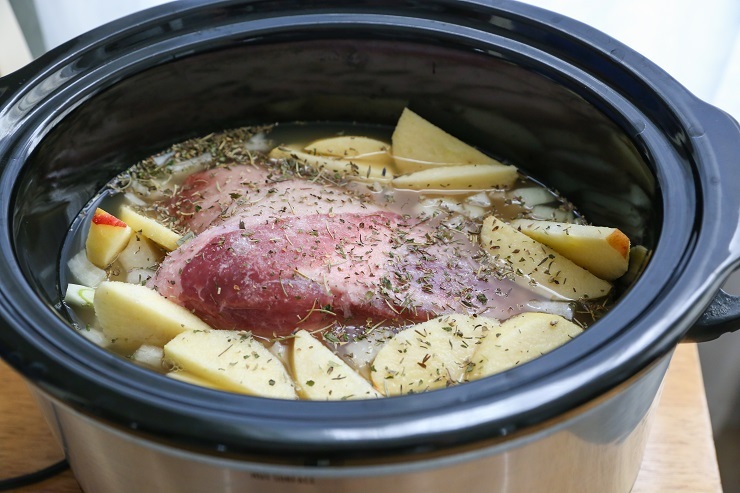 The crock pot pulled pork only requires 8 ingredients (10 if you count salt and optional booze), and about 10 minutes of preparation time….15 if you’re easily distracted by Christmas lights and Pandora radio. 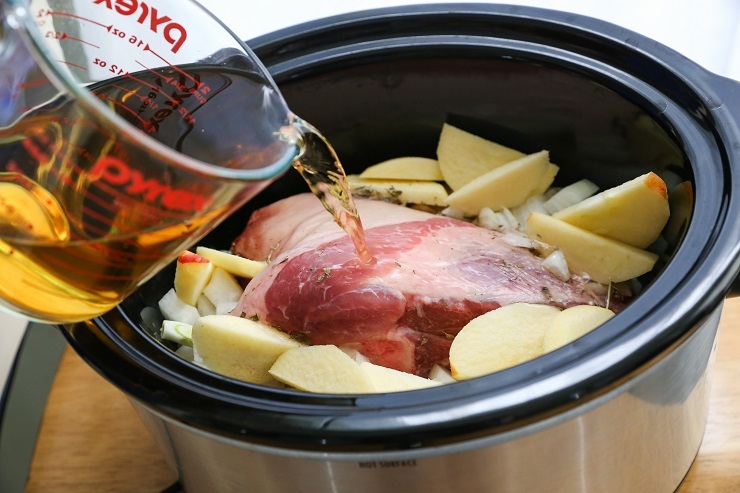 All you do is throw all of the ingredients in your slow cooker, turn the nob to low and wait patiently while your house fills with delectable aromas as the meat becomes tender. Timing this meat is also very forgiving. You’ll want to cook it on low for at least 6 hours, but it can go for much longer without needing to be monitored. I had mine cooking for a whopping 12 hours, and am thrilled by how easily the meat shredded, and how flavorful it became. I always recommend allowing meat to sit in its original juices for as long as possible after shredding it in order to maximize flavor and texture. After I shredded my pork, I allowed it to sit untouched overnight in the juices…perhaps the longest night of my life as consuming the pulled pork was much anticipated. Put it in your crock and cook it! Sprinkle the pork shoulder with Herbs de Provence (or Italian seasoning) and sea salt and gently press into the meat. 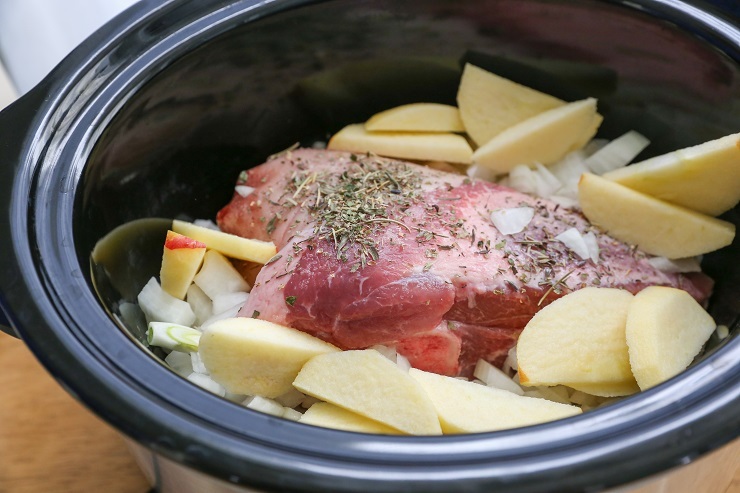 Place the pork shoulder in the slow cooker, along with the diced onion, garlic, and apples. Pour the apple cider and chicken broth into the slow cooker. Cover, and set slow cooker on low for 6 to 10 hours, until meat is very tender and pulls easily away from the bone. Transfer the pork to a cutting board and use two forks to shred the meat. Transfer the shredded meat back into the crock pot, discarding the bone. Allow meat to sit in the juices at least 1 hour before serving (if possible). Taste the meat for flavor and add sea salt to taste. While rice is cooking, saute the chopped kale in a small amount of olive oil in a skillet over medium-high heat until wilted, about 5 minutes. 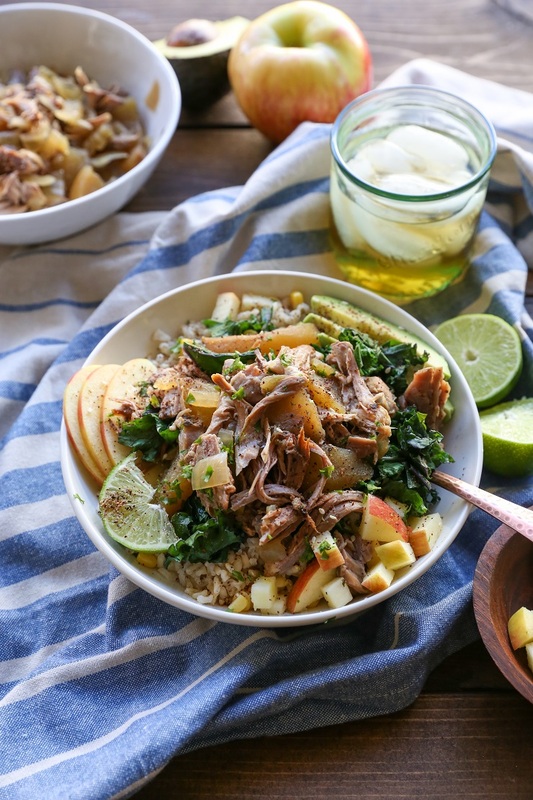 Add desired amount of rice to bowls and top with sauteed kale, pulled pork and apples, and sliced avocado. Spoon the pork-apple juice from the crock pot over the bowls and sprinkle with sea salt. Serve with lime wedges and enjoy! I’m hoping that santa brings me a slow cooker for Christmas and then I’m sure I’ll be wondering how I ever lived without it! This bowl looks like it’s filled with so many delicious things! I hope you are enjoying the winter, Julia! Merry Christmas! 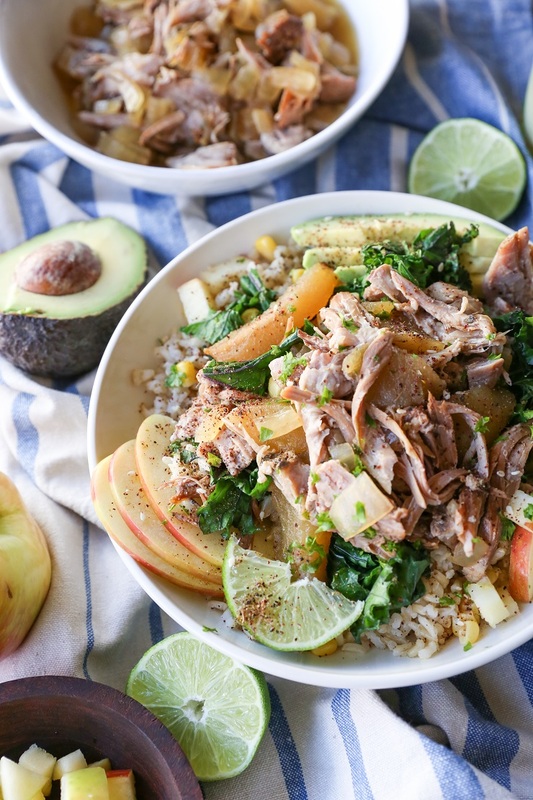 That bowl of pulled pork, fruit, and veggies looks just amazing! I love this new take on pork with apples and cannot wait to try it. Hi I am planning on making this dish this weekend. I was just wondering if you leave the slow cooker on while you let the shredded pork sit in the juice. Also, any tips on reheating without drying out the meat? 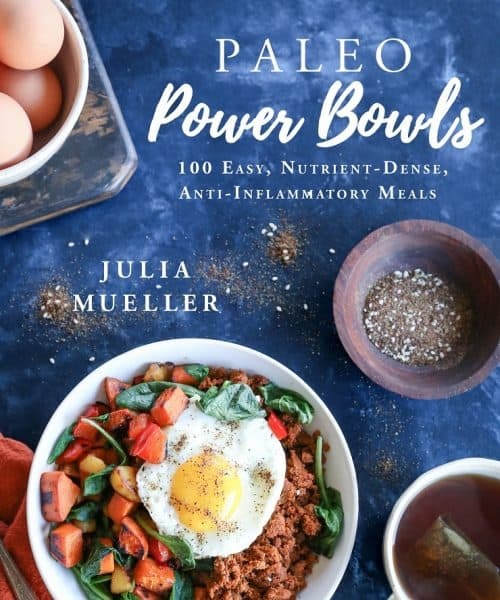 Thanks for the recipe – can’t wait to try it out! Hi Rachel! 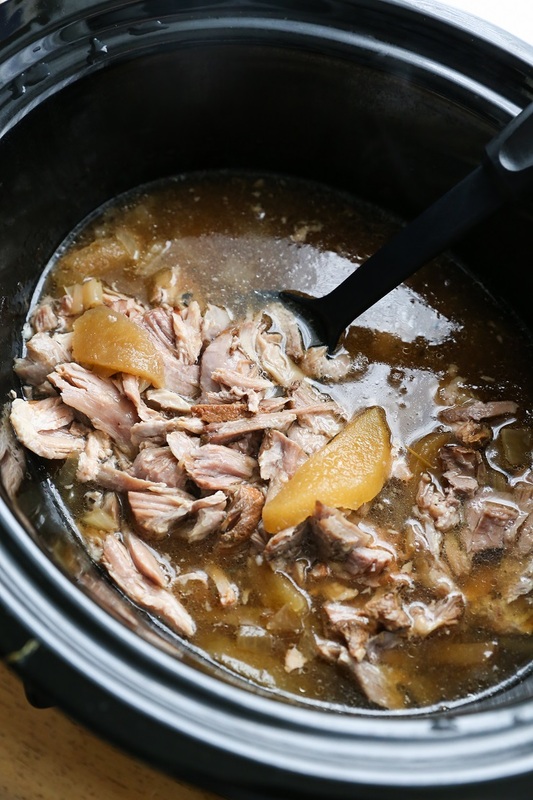 I turn the crock pot off while I let the meat sit in the juices, but you can go either way – if you’re wanting to keep the meat warm and let it absorb a lot of flavor, I’d say go ahead and leave the crock pot on and allow that meat to sit! If you’re serving soon after shredding, you can turn the crock pot off. I save the meat with the juices (I stick the whole crock pot in the fridge after it has cooled) so that when you reheat it, you use some of the juice to reheat. The meat will become more and more flavorful as it sits, so definitely be sure to keep the juices for optimal flavor! Hope that helps, and hope you enjoy!